Another day, another Kickstarter. With a mild interest in Steampunk and a vast interest in civ-building/expansion/combat games, Clockwork Wars immediately caught my attention when I heard about it. I had the chance to sit down (virtually) with designer Hassan Lopez to talk about the game. The game is burning up Kickstarter right now, and if you’re thinking about it one way or the other, you’ve come to the right place. Read on, faithful readers, to discover the wonderful world of Clockwork Wars. World, meet Hassan. Hassan, world. Tell us a bit about yourself and your background in the game industry. Is this your first published game? If not, what other games have you designed? Yes, Clockwork Wars is my first published game. I sent around a prototype of it to a couple different game companies in 2009-2010, and Eagle Games (to my great delight) expressed immediate interest. I’ve loved board games since my brother introduced me to Avalon Hill back in the 70’s, and I don’t shy away from any genre. Two of my current favorites are Space Hulk and Claustrophobia – both great tactical games, with fantastic atmosphere, great tension, and asymmetrical sides. I’m also a big fan of FFG’s Star Wars: X-Wing game – the hidden movement system is great, of course, and the minis are beautiful. Among Eurogames, I love Fresco and it’s my go-to gateway game to get people into the hobby. Mage Knight and LOTR: the Card Game when I’m playing solo. What made you decide to start designing? I’ve literally been toying around with board game design since middle school. I was playing a lot of Talisman, Dungeon!, and red-box D&D back then, and especially the latter got my imagination running. I sent in my first game submission to a publisher in 7th grade, and it was accepted! Then the company went under and I never heard from them again… C’est la vie. I always have a couple designs floating around in my head and notebooks, but really, it’s mostly for fun. It’s my creative outlet. Some people paint, some people write short stories, I like to daydream about game mechanics and put together prototypes. Clockwork Wars. Tell us what the game is all about. Clockwork Wars is a strategy, “conquest” game for 2-4 players (5, with the expansion) that’s set in a fantasy-steampunk universe. 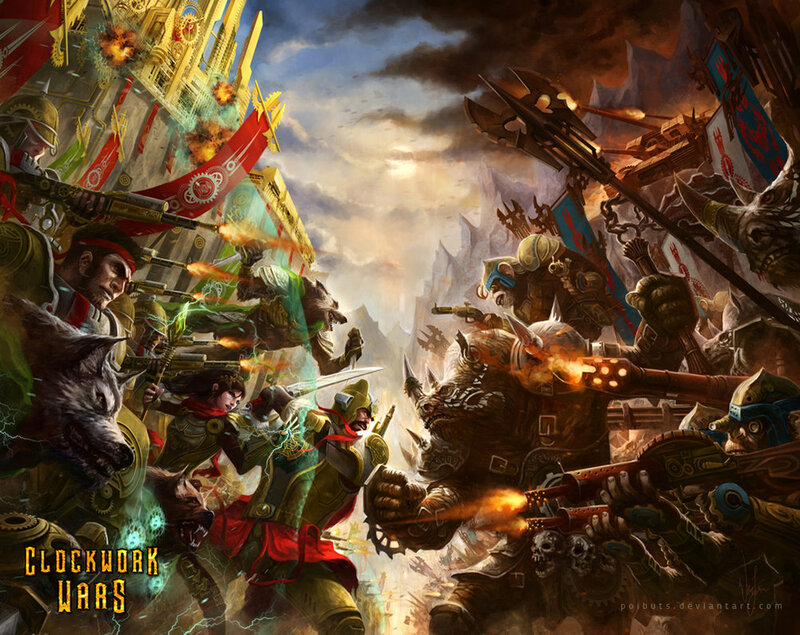 You play as one of four different races fighting in a brutal civil war that has raged for ages. Your goal is to accumulate the most victory points through seven turns of play – this limit on game length helps prevent Clockwork Wars from taking up your entire evening, and also focuses players’ attention on concrete goals. There are several ways to garner victory points: by controlling resource territories on the map, by researching potent discoveries, or by exerting the most influence in the court of a powerful family. Obviously a central aspect of the game is battle. Players deploy units to the map in an effort to expand their territory, and each territory you control gives you a special benefit (such as generating influence in one of the three research disciplines). Combat resolution is dice-less and very fast, but players’ armies can be modified through reinforcements, discoveries, and espionage cards. There’s a slight “civilization” feel to Clockwork Wars, as you progress through three successive, historical ages over the course of the game. Each age opens up new discoveries to research and ends with a scoring phase. Will the 5-player expansion be available right away, or is that something coming down the road? The Sentience expansion will be available right away, along with the base game. If you pledge at the Emperor level or higher on our Kickstarter, you’ll get both (for a substantial discount on the combined MSRP). Where did the idea for Clockwork Wars start? To be honest, it mostly emerged from my desire to steal (borrow?) from real-time strategy (RTS) games on the PC. There a lot of things to love about RTS games – fog-of-war, tech trees, epic battles, special powers, etc. Anyone remember Rise of Legends? I started thinking about how I could emulate some of those mechanics in a board game, moving away from traditional “you-go, I-go” turn-based wargaming. This is how I set upon the hidden deployment system, the territories that generate research and victory points, the blossoming tech tree, and the uber-units (Generals). 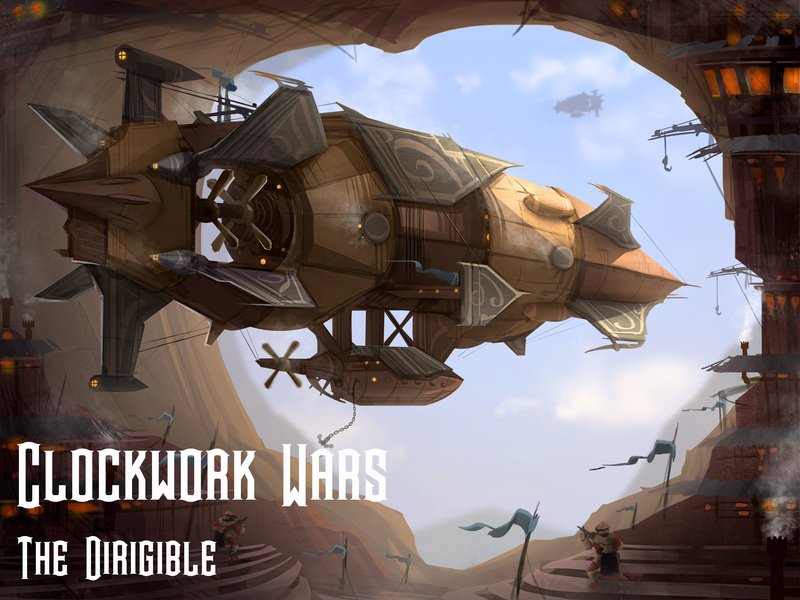 Clockwork Wars uses some traditional RTS mechanics, but isn’t “real-time” – so you have the leisure to be an armchair general and deliberate over your strategies. There are a few elements that, I think, set this game apart from other, excellent modern strategy games. First, it’s designed for infinite replayability. 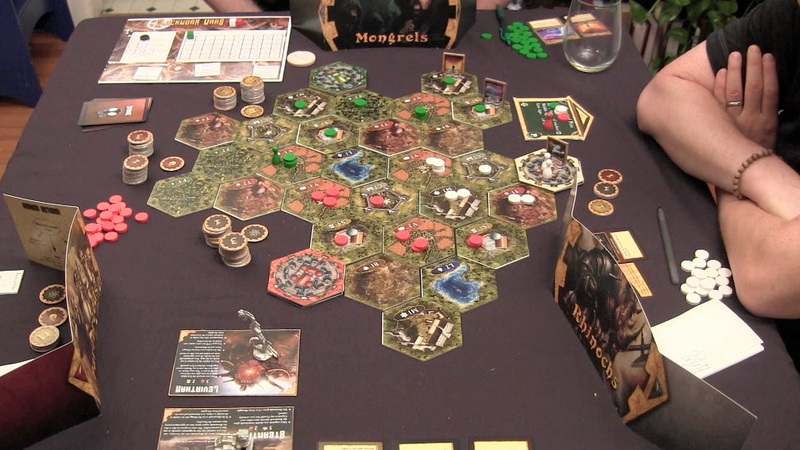 Clockwork Wars features a modular map composed of hexagonal tiles. There are 11 different territory types including villages, towers, citadels, shrines, manufactories, and observatories), and you will use anywhere from 20-40 tiles to generate a unique map for every game. Prior to every game, players will also generate a unique “technology tree” by picking 9 different discovery cards: 3 sorcery, 3 science, and 3 religion. We include 45 different discoveries in the base game, so you’ll probably never see the same combination twice. Second, Clockwork Wars features hidden and simultaneous unit deployment. Most war games use an “I-go, you-go” mechanic, which is both unrealistic and slow. 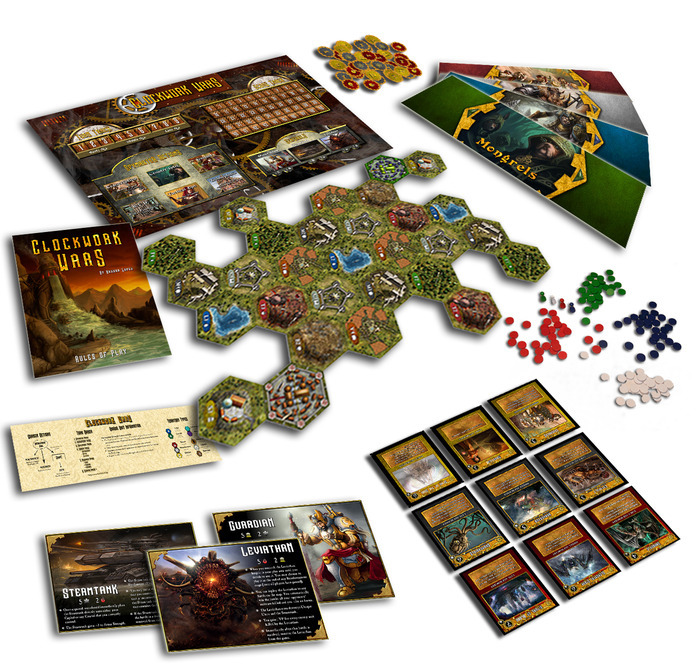 Instead, in Clockwork Wars players make their decisions about where to send their armies in secret, by writing down their orders (made easy, since every tile in the game has a unique ID tag). Then, all players reveal their decisions simultaneously, put their units on the map, and resolve any battles that ensue. There’s enormous tension with this kind of system, since you need to do a little “mind-reading” of your opponents! It also allows for bluffs, surprise attacks, and surprising turn-arounds. Because everything is simultaneous, there’s no down-time and players feel constantly engaged. An actual prototype in the wild! The simultaneous play sounds interesting, although writing things down sounds like it might get tedious. How many “orders” do you end up writing on any particular turn? About how long does a game take to play? I totally understand some people’s hesitation over ‘paper-&-pencil’ mechanics, but I also firmly believe it’s an underutilized system in modern board games. In Clockwork Wars, writing down orders takes seconds. In a given turn, you might write down 3 or 4 orders and each one looks something like this: “2 -> T2” (meaning, 2 soldiers deployed to the tower labeled T2). Everyone’s writing down at the same time, so it really feels like a battle of wills and mind-reading. I really like trying to fake people out by overacting the value of certain territories, and trying to push them into foolish deployment decisions. Some people have been asking whether I could have used a different mechanic for the hidden deployment, such as a token-based system like that used in the Game of Thrones game. But the written system gives players the most flexibility and fog-of-war to surprise their opponents by allowing moves that a token system can’t. Here’s a specific example:Every race in the game has a “unique unit” with special abilities. The Purebreed unique unit is called the Operative. The Operative doesn’t have to follow normal deployment rules and can be deployed to any territory on the map every turn. It’s the ultimate spy-paratrooper. Furthermore, if it ends up on a territory with a single enemy soldier, it can assassinate that soldier during the reinforcement stage. This makes the Operative adept at jumping behind enemy lines and cutting off supply lines. But it’s a guessing game (for you, and your opponents) every turn. Often, players don’t place more than 1 soldier on towers, shrines, and manufactories – so you could send your Operative to attack a Trog tower – but what if the Trogs player sees you eyeing her tower, and she decides to deploy another soldier there “just in case”? Then your Operative is toast when it comes to the Combat Phase. This kind of secret jumping around just wouldn’t be possible with tokens. A typical 2-player game of Clockwork Wars will take between 60-90 minutes. Each additional player adds around 15 minutes. 4. Are there any particular elements/mechanisms of the game you’re particularly proud of? Probably the research system. It’s important to me as a designer that theme and mechanics are coherently meshed in my games, and the place where this principle shines through most effectively in Clockwork Wars is the research system. The 7 turns of the game are divided into 3 ages: the Early Age (turns 1-2), the Middle Age (turns 3-4), and the Late Age (turns 5-7). Within each Age, there are three different Discoveries available for players to research. These Discoveries fall into one of three different research disciplines: sorcery, science, and religion. This is a world where steam-era technology, dark sorcery, and fundamentalist religious doctrine co-exist and are often at conflict with one another. 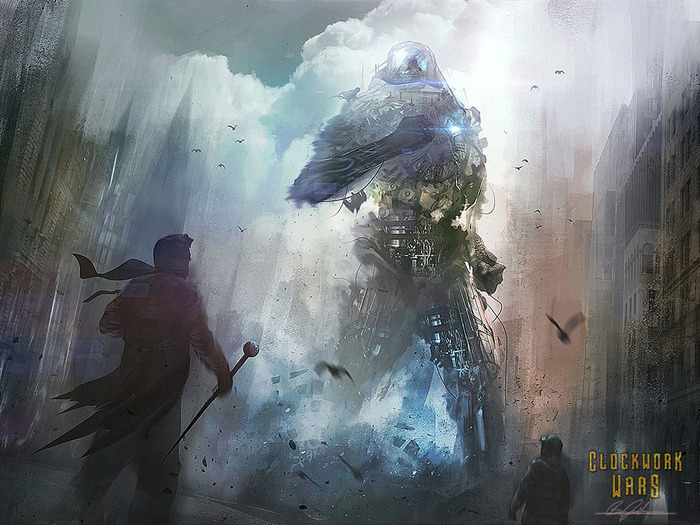 Thematically, I was heavily influenced by modern steampunk settings, like China Mieville’s world of Bas-Lag and even the classic computer RPG, Arcanum: Of Steamworks and Magick Obscura. Sorcery discoveries are typically the most expensive and powerful in the game. They often let you do direct damage to your opponents, killing their soldiers at no risk to your own. There’s even a Late Age sorcery discovery (Cataclysm) that lets you destroy the map, one tile at a time! If you like to play aggressive, Sorcery is for you. Science discoveries will often increase your recruitment, enhance the strength of your armies, or provide you with additional means of generating VPs (like the Analytical Engine). If you like flexibility and intimidating research engines, science is for you. Religion discoveries are the most affordable. Many are defensive in nature or allow you to take further advantage of villages, cities, forts, and shrines. If you want to field a larger army on the field (because you don’t have to invest workers in research as much), along with strong defensive capabilities, religion is for you. To research Discoveries, you need to earn Influence Points (IPs) in those three respective disciplines. Sorcery IPs are earned by controlling towers, science IPs are earned by controlling manufactories, and religion IPs are earned by controlling shrines. But there’s often a race between players for these powerful Discoveries. All the Discoveries in the game have been designed to be potential “game-changers” – especially the Middle and Late Age Discoveries. The player who researches most efficiently and effectively is often the player who wins the game – typically this means dipping into all three research disciplines, since nothing’s forcing you to choose only one path. The most effective civilization is the one that utilizes the strengths of many paradigms. I don’t know what they’re guarding. Probably not the galaxy. Wow. Destroy the world? That sounds… pretty epic. Way to appeal immediately to my inner explosion-loving geek. Okay, so what’s the difference between IP and VP? Are there different ways of scoring VP and what are some of those ways? How does conquering/invading/combat come into play versus scoring points? IP are influence points, and they are the currency used to pay for Discoveries. For example, you need sorcery influence to buy sorcery discoveries. And you gain sorcery influence by controlling towers on the map. VP are victory points and if you end the game with the most, you win. You primarily will earn VPs by controlling Forests and Lakes – during Scoring Phases, these territories generate VPs for you. But there are many discoveries that also generate VPs – like the Spire of the Gods, which gives you 5 VPs if you place it in a shrine and control that shrine with at least 3 units at the end of the game. Finally, you can earn VPs by controlling a “court”, which represents a powerful neutral lord. At the end of the game, courts can give you anywhere between 3-5 VPs. As you can see, conquering territories is central to both accruing IPs and VPs. You need to control tower, shrines, and manufactories if you want to research powerful discoveries – and you need to control lakes and forests if you want VPs. But you also need to conquer villages, since they generate more workers for you, and citadels, since they let you reinforce battles. Basically, every territory type is valuable, so you always have choices of what strategy you want to pursue – and each map will present you with different challenges and opportunities, since what’s close to your capital at the beginning of the game changes every time. It wouldn’t be Steampunk without a dirigible. With regards to the Kickstarter itself, we’re thrilled to be over 200% funded at this point. I’m a pessimistic person at heart, so I was really expecting to see $0 staring at me for the entire duration of the campaign. Ha! But now we’re really trying to keep the momentum going through the typical mid-campaign lull, and recruit as many backers as we can so that we can open up more stretch goals. We’ve already achieved 1) more unique art for the game, 2) thicker hexes, and 3) larger player screens. 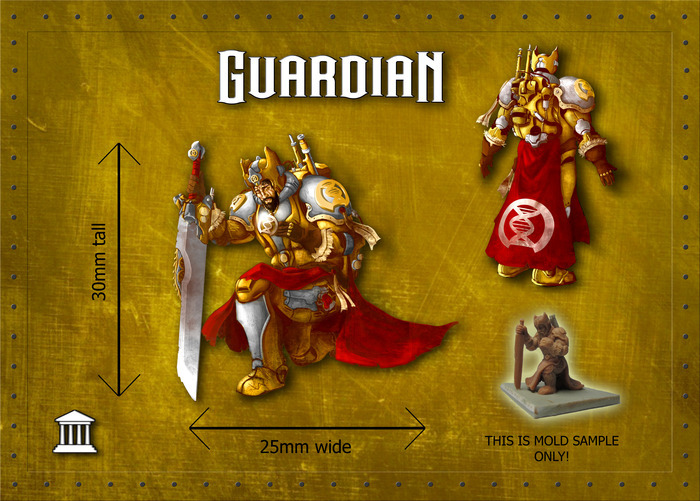 Our 60K goal is especially exciting to me, as it will allow us to include 6 additional miniatures in the game. There will already be 3 awesome minis in the game, representing the uber-powerful Generals that players can recruit to their side. But each race also has a unique unit, and we’d love to develop minis for these guys as well. At 70K, we’d not only get bigger and better cards (featuring our amazing art), but also a Kickstarter exclusive item for all our backers: 2 unique terrain hexes. This will give players even more options when designing their own maps. I really think Clockwork Wars is going to be a unique gem in the strategy game world. The rules are easy to pick up but the game’s many strategies and options (and general lack of randomness) reward intelligence and wit. Please visit our Kickstarter site, or BGG site, and watch my play-through video to see if this is something you’d like. This has been an immensely gratifying and humbling experience, and I’m thankful to all the people who’ve already supported our project. Thanks, Hassan, for the interview. The game sounds like a good time, and congratulations on funding already! This game looks great, and the strategic possibilities are deep. Go check it out on kickstarter and give it a pledge to help the game hit stretch goals and become even more awesome!